Robust flavours. Main meal or side dish. Preheat the oven to 200°C, gas mark 6. Cook the beetroot in boiling water for 15 minutes then drain, run under cold water to cool and cut into 1cm thick slices. 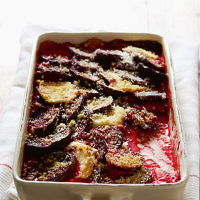 Grease a 1 litre shallow gratin dish and layer the sliced beetroot and goat’s cheese, seasoning each layer. Whisk the cream with the horseradish, pour over the gratin and scatter the breadcrumbs on top. Dot with butter and bake for 15–20 minutes until golden and bubbling. Serve with watercress salad and walnut bread. bake for 15–20 minutes until golden and bubbling. Serve with watercress salad and walnut bread.